I picked the word smiling because, I always smile even when i'm sad or happy. It's like a nervous habit of mine. I think I did good with the color and effects. I picked yellow because yellow is the color for many bright things like lightbulbs, stars etc. I have a pretty good margin. I put space between me and the quote, space between the adjective and the quote, and space around the quote so on the side. I picked the font Moon Flower because Smiling is a very positive word, and is also very up lifting so I knew i had to pick a very nice positive font, one that's handwritten or something. So I decided to go with Moon Flower because it's not really that bold and big, it's smooth and looks pretty positive. The size in my opinion was the hardest because I didn't really know if it was too big or too small and I also didn't know how it would look when I print, so I guessed and it turned out pretty good. In my image you see 6 skeletons of the human body lined up together, with 'labels'. The labels are race and sexuality. White, Black, Mexican, Muslim, Gay, and Straight. 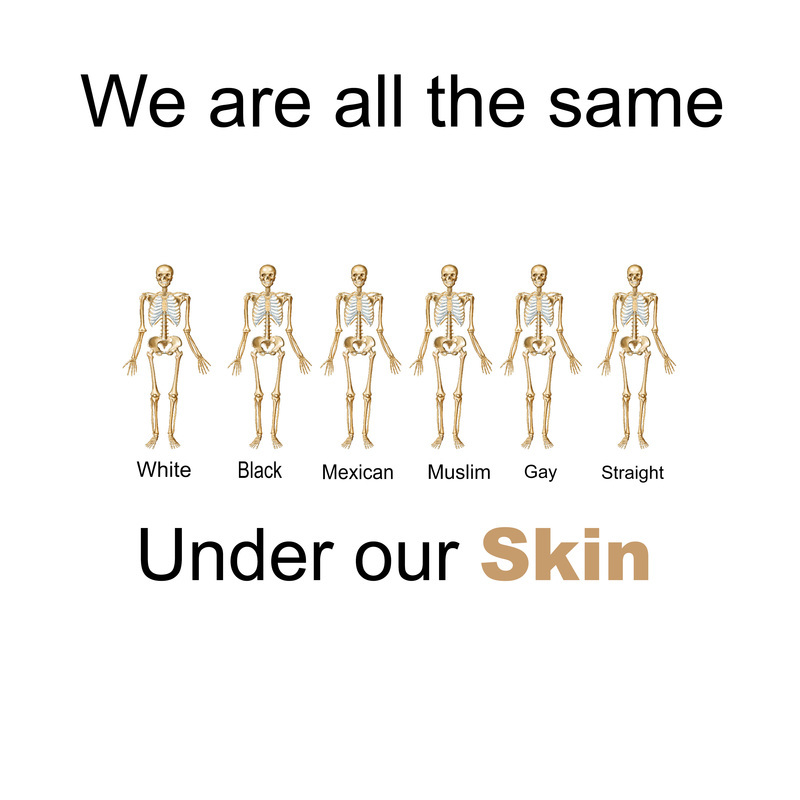 In the phrase "we are all the same under our skin" I put 'skin' a different color. I got the idea from images I've seen in the past, but the message is different. I also got the idea from conversations and videos. When we were talking in class i got the idea, from the video "I am not black, You are not white", he was talking about labels and how people use those labels to describe us and 'judge' us. And I wanted to do a picture that describes that we are all the same no matter our skin color, sexuality, or 'label'. My message is to teach/show people that if you take away all of everyones labels, and stereotypes, you only have a human with feelings, and so the skeleton shows that we all look the same no matter what gender, sexuality, race, religion. We are all one. I decided to post my poster around the school to bring a sort of comfort and positive vibe to the students and teachers since their has been a lot of hate and fear going on with the election, and I wanted everyone to feel safe and comfortable with themselves. After posting this I want people to feel a bit more accepted and less fear, I want to want to come to school, to feel like they matter, because they do, everybody matters. And what's even better is that Chute is a very diverse school with different people with different genders, sexualities, religions, and races and so that's even more comforting to the people who are scared and don't feel comfortable in their skin. By posting this I hope I can bring a bit more of comfort and joy to whoever is struggling with accepting themselves. The thing I'm most proud of is the Project 2 that I made in Photoshop, It was something that I was keeping inside of me for a really long time, I was angry, sad, scared and confused and so I decided to make a poster that showed what I was thinking it turned out to be really good, and I'm really proud of it. My favorite things/parts of the class was getting to go on Photoshop and working on it. I liked the wood carving machine that was really cool, the way it would carve your designs. I think the wood carving machine should be used more next trimester.